When evaluating your health, there are a variety of metrics that can indicate whether you’re in prime condition or not. A doctor may measure your height or read your weight on a scale. They might take your temperature using a thermometer, or they may evaluate how fast or slow your pulse is. One common way of checking a person’s health is to measure the amount of oxygen currently your blood, called a blood oxygen saturation level. This is done using a process known as pulse oximetry. 1 What is Pulse Oximetry? 2 How Does a Pulse Oximeter Work? 3.1 1. What’s the Reason? Pulse oximetry is the method used to measure what percentage of your blood is saturated with oxygen. Inside, your red blood cells take oxygen from your lungs and carry it to be used in other parts of your body. Blood oxygen saturation levels are presented as percentage and are indicative of whether or there not there your blood is carrying enough oxygen. Readings are often taken during such activities as sleep or exercise. You might also check your blood oxygen saturation levels during your daily life if you suffer from a health condition (such as COPD). Low saturation levels are referred to as “hypoxemia” and can cause serious health problems such as hypoxia (low oxygen in your tissues), or symptoms such as shortness of breath, wheezing, and cough, among others. In order to test your blood oxygen saturation levels, you’ll need to use a machine called a pulse oximeter. A pulse oximeter is a common piece of equipment used in the doctor’s office, typically used at the same time that your temperature and blood pressure are taken. It’s a small device that traditionally has a finger clip, assorted cables, and a small visual unit where results are displayed. The use of a pulse oximeter is non-invasive, meaning it does not require a blood draw or other invasive techniques. To use it, a clip is placed on a fingertip, and a bright light inside the clip shines and determines how easily the light passes through your finger. The results are calculated and a percentage is displayed telling you your current saturation level. While the pulse oximeter is a simple piece of equipment, it is not without its limitations. The pulse oximeter measures the amount of oxygen in your blood, but it will not measure the amount of carbon dioxide present in your blood. The machine also might not function properly and might show the incorrect blood oxygen saturation level if you have cold hands, which result in reduced blood flow through the fingers. The light on the clip might also display false low readings if the person using it has painted fingernails (since dark nails will not let light pass through as easily). In order to choose the best pulse oximeter for you, follow this step-by-step guide to choosing features, optional accessories, and brands for your new pulse oximeter. For reviews of specific brands and models, check out the following section with the reviews of the top 6 pulse oximeters available to purchase. First, decide what your purpose is with buying an at-home pulse oximeter. If you’re purchasing a pulse oximeter to check your blood oxygen saturation to monitor a non-serious medical condition, you may just need the device to check your saturation level alone and nothing else. For those looking to purchase an oximeter to improve their fitness levels, look for a pulse oximeter that displays both saturation level, and pulse rate (a fairly common feature from most mid-range oximeters). 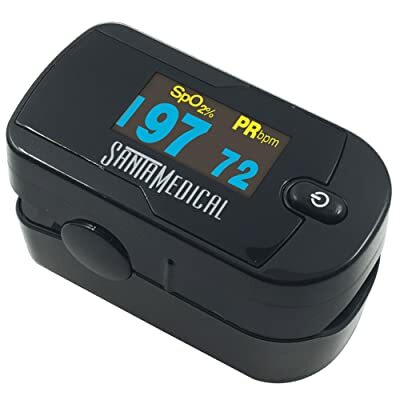 If you have a serious health condition, you’ll want to purchase a higher-end pulse oximeter model that not only shows saturation level and pulse rate, but also has alarms to alert you to when your saturation level is too low, and indicators to show you when you are taking your saturation level incorrectly. Finally, if you’re purchasing a pulse oximeter for your child’s use, look for a brand that is specifically designed for smaller fingers. Many pulse oximeters will not read correctly when used on a child. Once you choose what features you require in a pulse oximeter, consider the accessories you would like. If you require hands-free use or you’ll be using your pulse oximeter on the go, many models of pulse oximeters come with lanyards for easy storage around your neck or come with a carrying case that can clip onto your belt. Both of these features allow you to take your pulse oximeter with you anywhere and use them anytime, without making them bulky. Beyond these optional accessories, look at the brand name and the customer service options to determine which pulse oximeter is a quality product. Although pulse oximeters come in a wide assortment of prices, those at the more expensive end might include extras like customer service for the product, or a one- or two-year warranty. Brands such as Zacurate, AccuMed, and Santamedical have multiple pulse oximeters available on the market and are widely known as quality products. Pulse oximeters are available to purchase at your local drugstore, but a wider selection is often available through online retailers. This gives the added benefit of being able to read users reviews of each pulse oximeter, allowing you to make an informed decision. Once you’ve purchased a pulse oximeter, it’s a very simple process to check your saturation levels. Most at-home pulse oximeters come with only one to two buttons, and all parts are contained in a single unit (without cables) that clips onto your finger. Check your specific model for directions, but for most oximeters you will simply turn on the unit, clip to your finger, and wait for the display to stabilize. Ensure that your finger is clean, free from polishes, and dry prior to use. Whatever model you choose, the oximeter will have some kind of digital display on the top of the clip. On basic models, the display shows the blood oxygen saturation level (often labeled as SpO2) displayed as a percentage. The oximeter might also show pulse intensity or waves in bar graph form. A basic model, the Zacurate Pro Series 500DL is widely utilized device by athletes everywhere. It has a large digital display that makes it easy to read while on the go, allowing you to easily check your blood oxygen saturation level, pulse rate and pulse strength pre- and post-workout. The operation is simple, displaying SpO2 and pulse rate, without extra readings cluttering up the display. With features like a long battery life and quality manufacturing, the Zacurate Pro Series 500DL is sure to be a necessary part of your daily gym bag. Recommended for: Adult athletes such as climbers, skiers and bikers that are keeping track of their saturation levels and pulse rates for fitness purposes. 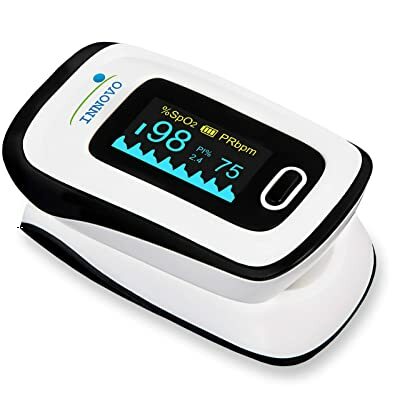 The Deluxe Fingertip Pulse Oximeter by Innovo comes with additional features not found in some of the other pulse oximeters included on this list. With additions like a plethysmograph and perfusion index, this pulse oximeter will not only help you use the device properly, but it’s smart enough to let you know when there’s a problem. These additional features are included without sacrificing the basics; SpO2 and pulse rate are still displayed on a digital display embedded within the clip. Recommended For: Those who might require an at-home pulse oximeter due to serious medical conditions, or those who might need the extra prompts and alarms to use the product (such as older adults). While this pulse oximeter comes with the standard SpO2 monitor as well as a pulse rate display, it stands out from other pulse oximeters with the inclusion of a rotatable display. This makes the pulse oximeter easy to use for caregivers, who might be sitting across or next to the user. In addition, the Generation 2 OLED contains a Plethysmograph, which measures the volume of blood being pumped and displays it through an amplitude graph (convenient when you want to know not only how fast your blood is pumping, but how hard). This pulse oximeter also comes with a neck or wrist cord, batteries, and customer service in the form of a one-year warranty. The design is simple and operation is accomplished through one button, allowing you to select one of six preset displays on the large LED screen. The display can be viewed from four directions as well. These two features allow you to see exactly what you want and from where when the unit is in operation. Recommended For: Caregivers (due to the rotating orientation and additional features) will love this product. 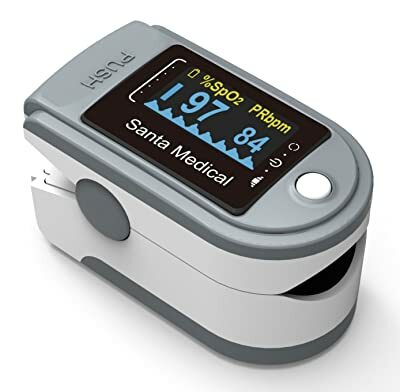 Though this is the second Santamedical device on this list, this pulse oximeter is it’s own device and shows the diversity of the Santamedical brand. The Generation 2 SM-165 has additional features that the 2 OLED does not, such as a carrying case and pulse wave and pulse rate graphs. The ability to control screen brightness makes it useful not only in low light situations but helps makes the battery last longer. This device also includes an indicator of the current battery level. If you have a serious medical condition and you’re worried about batteries running out, this might be an important feature for you. Recommended For: Fitness use by athletes, or medical use by caregivers (due to the information available and the potential for multiple display directions). While this pulse oximeter only shows up to 99% SpO2 (others show to 100%), the wider range of pulse rates and rotatable display means this might make a great option for those tracking fitness levels or for pilots who are concerned about hypoxemia and are keeping tabs on their SpO2 levels. The large display size means the readings are easy to see, even while being active. 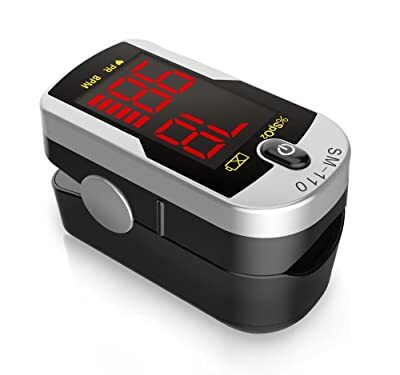 Recommended For: This pulse oximeter is recommended for athletes and also for pilots flying in high-altitude conditions. At the end of our list is the AccuMed CMS-50D. 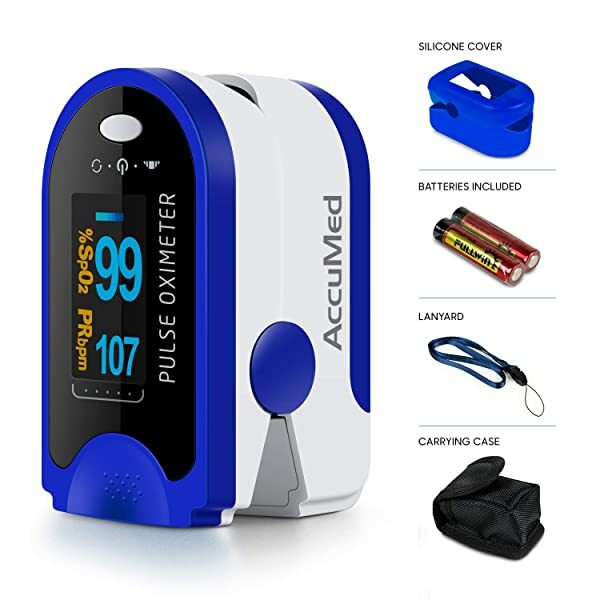 This pulse oximeter might be a good option for those that have no use for extra features like low saturation level alarms, accuracy indicators, or battery level readings. A workhorse at the basics, the CMS-50D reads and displays SpO2 and pulse rate, but it also shows pulse intensity as a bar graph, and pulse wave in wave form, giving you all the information you could want from a pulse oximeter. The CMS-50D also has a rotatable display, but unlike other models, the proper orientation is automatically selected based on the orientation of the device. Best of all, it’s recommended for children as young as four, making it a great option for those with very small fingers. 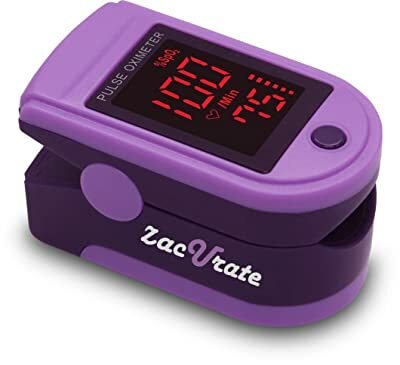 Recommended For: This pulse oximeter is targeted towards athletes but is also specifically designed for children as young as four, a feature lacking from most of the other pulse oximeters on our list. Whether you only use a pulse oximeter at the doctor’s office, or you purchase one for home use, understanding why a pulse oximeter might be utilized, how it works, and what pulse oximetry is, are all important parts of becoming knowledgeable about and taking charge of your own personal health.